The GSBS is the worldwide leading forum for Social Business. It is an annual event is organized by the Nobel Peace Prize laureate professor Muhammad Yunus and his creative advisor Hans Reitz, and gathers experts from the private sector, civil society, governments and academia over a few days of meetings, forums and workshops. The event aims to spread awareness about Social Business, foster discussion and collaboration between practitioners and stakeholders, as well as present and conceive best practices. The main topics for this year is Plastic & Circular Economy, Mobility, Solidarity, Sports & Social Business and Food & Its Value. 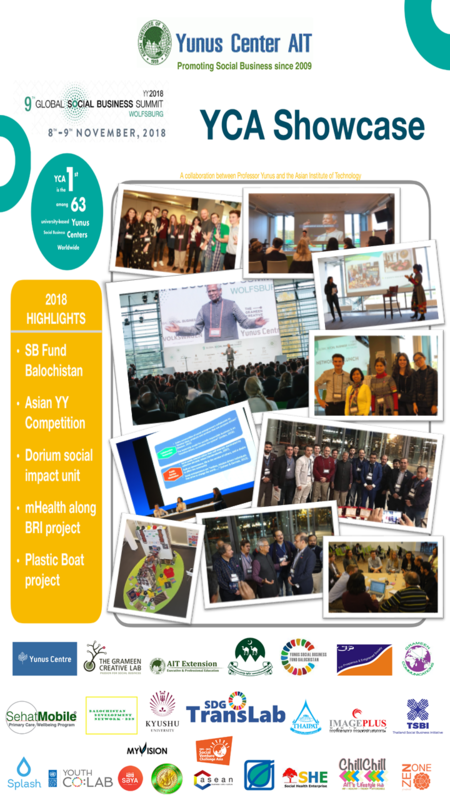 Yunus Center AIT (YCA) together with our newest partner from Balochistan: Yunus Social Business Fund Balochistan joined the GSBS 2018 in Wolfsburg, Germany during 6-9 November. We was featured as one of presenters, both in the Young Challengers' & Pioneers' Meeting and Academia session, and at as usual. At the academic conference, Ms. Rowena Alcoba, our senior program, has presented on "What makes Social Business Tick?" - a study of motive, commitment, collaboration tendencies, Entrepreneurial Orientation and sustainability perception of social business leaders and advocates. We also got a chance to hosting the social business 101 workshop and presenting one of our Social Business project "Chill Chill: AIT's Lifestyle Hub" which is presented by the founder; Ms. Kanyarat (Ice) along with our international associate; Lucrèce, at the Young Challengers' & Pioneers' Meeting. It's full with interactive and lots of fun. Apart from mentioned, each member of the YCA delegation attended different workshops, facilitated and discussed relevant to their responsibilities at YCA, thus gaining useful insight and expressing interest in future collaborations and synergies into the various aspects of Social Business. Check out more at our facebook page"Yunus Center AIT"